The French Landes...land of wines, lakes, nature and welfare, not far from the Basque Country. This coast, famous all over the world, is a large natural park that stretches for hundreds of miles, among protected sand dunes, pine forests and surf spots among the best in Europe. This is an surf camp package with accommodation in our Hossegor surfhouse with breakfast, 5 surf lessons of two hours each, transport to the beach, surf equipment rental, daily free surfing session in the afternoon and complimentary surf kit! IMPORTANT: The weeks of Quiksilver Pro France are considered as "High Season". IMPORTANT: For all months except August, staying in the surfhouse is not restricted to weeks. So, you arrive and depart iwhenever you want. Instead, in August, bookings go from week to week so the choice is whether to take one or more weeks. Getting to the French Landes is very easy, from several European airports there are low cost flights, such as Ryanair and Easyjet, which fly directly to Bordeaux (BOD), at 1 hour drive from the camp, about 140km. You can also fly to Biarritz (BIQ), often via Paris, much closer, about 20 km from Hossegor. Or you can fly to Bilbao airport, very well connected to many European airports, but more than 2 hours away from the camp. Bordeaux - Hossegor: -By car:The most convenient way is to rent a car or drive your own vehicle to the camp. About 140 km, 1h30 min. -Public transports: take a train from Bordeaux S.Jean to Saint Vincent de Tyrosse with change in Dax and then bus a from Saint Vincent de Tyrosse to Soorts Hossegor (approx 3h). 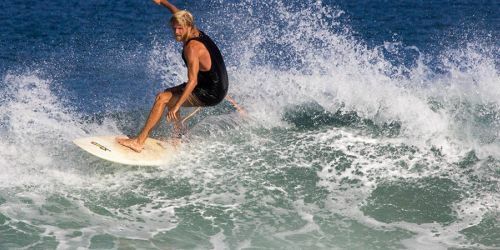 Biarritz - Hossegor: -By car: The most convenient way is to rent a car or drive your own vehicle to the camp. About 20 km. -Public transport: Take the bus to Bayonne and then another bus to Soorts Hossegor. If you prefer, the camp offers an airport shuttle service, tell us your landing time and the flight number and we will pick you up at the airport for an additional cost. France is part of the European Union. An European identity document is sufficient to travel in and out the country. Healthcare is free for the European health card holder. Most nationalities out of European Union do NOT need a special visa to go to France (90 days on arrival), we always recommend to check the validity of your passport before traveling (at least 6 months validity from the scheduled return date) and to take various copies of your passport with you, if the original gets lost. Public and private hospital facilities have high standard level, however, we recommend traveling with an international travel insurance if you are NON European citizen.